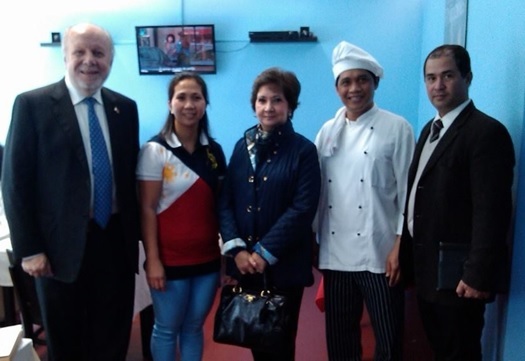 Philippine Ambassador to Portugal Philippe J. Lhuillier and Madame Edna D. Lhuillier poses with Peter and Lygeia Marie Cayabyab, owners of Kababayan Filipino restaurant in Lisbon, Portugal. Joining them is Consul General Gines Jaime Ricardo D. Gallaga. A Filipino-owned and themed restaurant has been making waves in Portugal, promoting the country's culture through its cuisine. Philippine Ambassador to Portugal Philippe Jones Lhuillier recently visited "Kababayan Restaurante", owned by Peter Cayabyab. Cayabyab, who had previous experience in the culinary business, put up the restaurant to provide Filipinos in Lisbon a place where they can have a taste of home. "I am thankful to Mr. Cayabyab for his contribution in promoting Philippine cuisine and culture to the Portuguese community. In support of his initiative, we provided them with Philippine tourism posters, audio-visual material, and brochures that they can use inside the restaurant. It makes dining in Kababayan more educational and more fun," said Amb. Lhuillier. Boasting of their famous adobong manok, rellenong bangus, and longanisa, Kababayan was featured in two publications in Portugal. Noted was the distinctive Filipino warmth and hospitality that the staff always shows the diners, and always serving their customers with a smile. Mr. Cayabyab has set his eyes on capturing an even bigger market in the local restaurant business through more aggressive promotion. He is counting on the local Filipino community for its support, and foresees a big potential in attracting Filipino seamen from cruise and cargo ships which regularly stop in Lisbon´s various sea ports.